When I joined the Rotary Club of Tacoma #8, I met a new friend who told me how he came to America after World War II. Erwin Kettner was from Bavaria; he and a friend boarded a ship for Canada sailing in steerage. Everyday they would sneak onto the upper decks and play music for tips from the wealthier travelers. The two friends worked their way across the Atlantic. They landed in Canada and bought an old Ford truck. 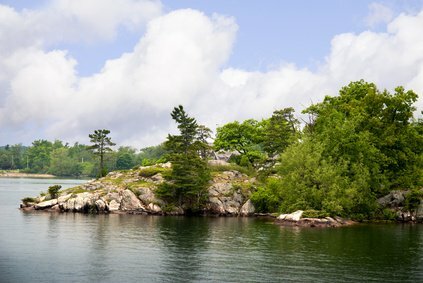 They drove down the St. Lawrence Seaway stopping along the way to fill their radiator with fresh water and to fish for eels, which they would either eat or sell. He crossed over into the U.S. in Detroit. Whenever I see eels I think of Erwin. My introduction to eel was at the Beni Hanna restaurant in downtown Seattle, Washington. The Japanese restaurant was just a block up the street from the Fifth Avenue Musical Theatre. We would stop in for happy hour before attending musicals at the theater. I would drink pineapple juice while Peg had a Japanese beer. For a dollar for each piece, we could sample the different kinds of sushi from trout roe to octopus. One of our favorites was "unagi." Ungagi is fresh water eel. By the time we liked it, there were no squeemish thoughts about the snake-like fish because we so much enjoyed the taste. Eels are found around the globe. People have been eating eel for thousands of years and yet we know very little about them. They can swim forwards and backwards and can even "swim" in tall, wet grass when they choose a destination. Their mating and life habits are the reverse of the familiar salmon. In the east coast of the US, the adult eels swim downstream and then make their way to the Sargasso Sea (Bermuda Triangle) where they mate (we think). Young eels are transparent and they travel along the coast until they find a fresh water stream to their liking. They travel upstream where they live until they start the cycle all over again. Man however has changed the cycle a bit. Eel fishermen in Maine capture the transparent immature eels and sell them to China where they are raised and then butchered and sold for consumption around the world, mostly in Japan. The eel we eat at the local sushi restaurant probably has travelled half-way around the world just to end up caught between two chopsticks on the way to your mouth. The Chinese have tried to breed eels, but so far have not been successful. 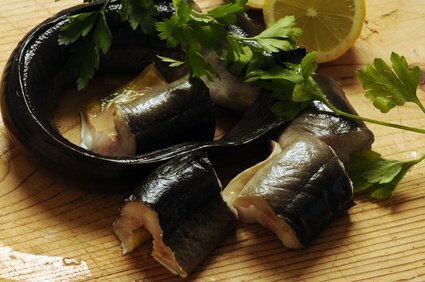 Besides having a great taste, eel comes with many health benefits to offset their high cholesterol content. Three ounces of eel contain 156 calories and provide 59% of our daily requirement of vitamin A, 17% of vitamin E, 15% of niacin, and 43% of vitamin B12. Those same three ounces of eel also contain 555mg of Omega-3 fatty acids and 167mg of Omega-6 fatty acids. As a comparison, salmon is lower in calories as well as lower in Omega-3s, but higher in Omega-6s. A link provided by the Linus Pauling Institute shows that a 2010 study by the Department of Dermatology at the University of Connecticut Health Center entitled "Healing fats of the skin: the structural and immunologic roles of the omega-6 and omega-3 fatty acids" reveals, "These fatty acids are showing promise as safe adjunctive treatments for many skin disorders, including atopic dermatitis, psoriasis, acne vulgaris, systemic lupus erythematosus, nonmelanoma skin cancer, and melanoma." Oriental cooking isn't the only way to enjoy eel. Smoked eel had to be high on the paleo list of good foods. 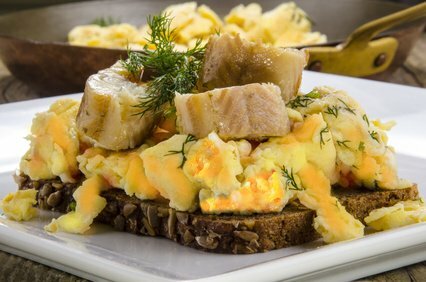 For a new taste treat you might try scrambled eggs on multi-grain or whole grain toast, like that baked by Roman Meal. You could add lightly sauteed eel or smoked eel on top. 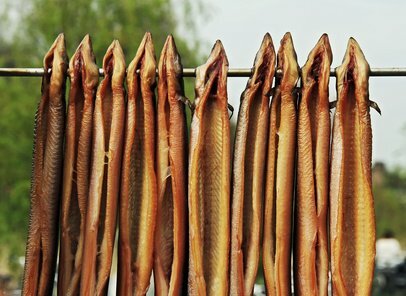 Perhaps, smoked eel could replace your morning ham or bacon and be better for you. After all, you won't find many omega-3 or omega-6 oils in your basic smoked pork products. You haven't lived until you sit around a campfire eating eel and eggs, in memory of a good friend, Erwin Kettner. 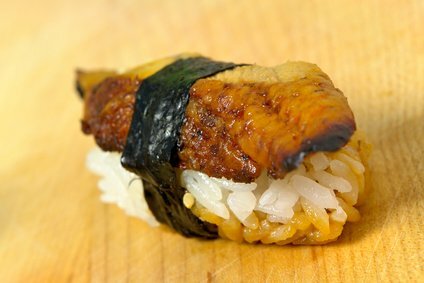 Paleo Eel and Unagi Sushi, free eel nutrition content article, unagi nutrition, Healthy Aging Article, Healthy Living Article.